My goal is to have one RIPE Atlas probe installed in every hackerspace -- combining work and pleasure. 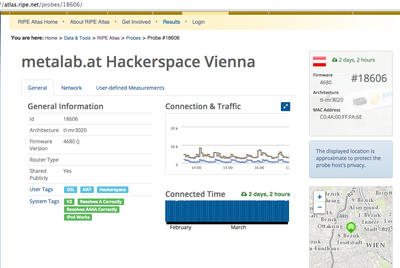 It is possible to add a user tag for your RIPE Atlas probe called "hackerspace" -- MetaLab did it! and select at the bottom the equipment "RIPE Atlas". 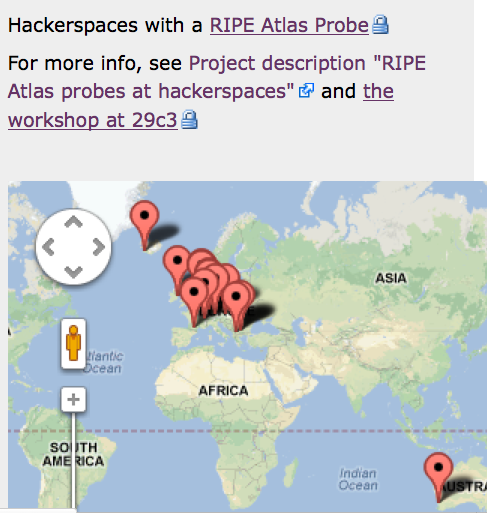 RIPE Atlas https://atlas.ripe.net is a measurements network consisting of 3000+ HW probes that send pings, traceroutes, DNS queries etc either to fixed targets (root name servers) or do customized measurements by the people who are hosting the probes. 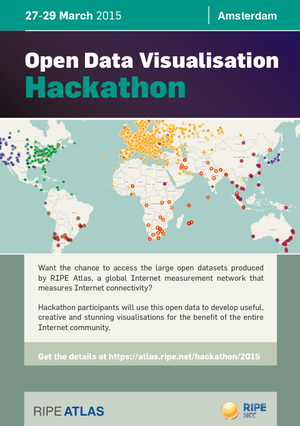 Data is made available to everyone, in form of maps and raw data. Probe hosts can get more details about their own measurements, earn "credits" for volunteering their bandwidth & electricity, and spend credits on customized measurements. Source code published! May 2013! May 2013: Randomdata workshop - coming up! This page was last edited on 22 December 2016, at 16:28.